Almaden Cycle Touring Club lists ride pace as part of the description for each ride listing. These are average speeds, assuming the ride is all on flat ground with no wind. Q: How can I find out my own pace level? A: This is easy, with the new Ride Pace Calculator. There is a link to it from the Stats page. It is at http://www.actc.org/ridestats/pace/pace-calc.php). 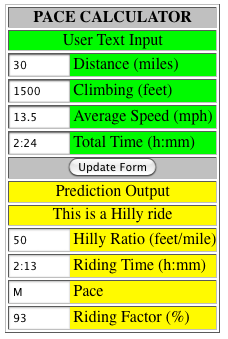 Let’s say you are doing a hilly ride and average 13.5 mph. Because of the climbing you can not use the simple definition to estimate your pace. However with this new calculator, you can use the amount of climbing to estimate your pace. Just ride your bike, and keep track of the total miles, average riding speed, and a good guess at the total feet of climbing for that ride. Using this calculator, enter the distance, climbing and speed. In the above example, it would be a 30 mile ride, with 1,500 feet of climbing and an average of 13.5 mph. That would mean a “M” pace. If you also enter your total time, then this calculator can also calculate the riding factor. Go to this webpage, then the 1st page is these instructions and a 2nd page is a graph and table for keeping track of your own rides. After entering a few rides, then it should become very clear what pace you are riding.